A semester-long workshop series that each year draws hundreds of students at Cuyamaca College and encourages them to embrace diversity kicks off Wednesday, Sept. 4, with a discussion of Chaldean culture and traditions. The interactive workshop -- the first of six scheduled this fall -- will focus on the origin, culture, practices, and traditions of Chaldeans in the world, and specifically in San Diego. Leading the 11 a.m.-noon workshop will be Sami Jihad, an outreach specialist for the Admissions and Records Office at Cuyamaca College. The college in Rancho San Diego enrolls many Chaldean students because of the large Iraqi refugee population in East County. The Diversity Dialogues -- all free and open to the public -- focus on a variety of diversity awareness and social justice topics. Students who attend at least three of the semester workshops earn a Diversity and Leadership certificate that can be used by those transferring to San Diego State University to earn credit toward the SDSU Multicultural Competence requirement. All workshops, with the exception of one on Sept. 9, are in Room I-207 in the student center. The one on Sept. 9 takes place in Room I-104. Art instructor Stephanie Bedwell has been sculpting new forms in the two years since she underwent a lumpectomy for breast cancer. 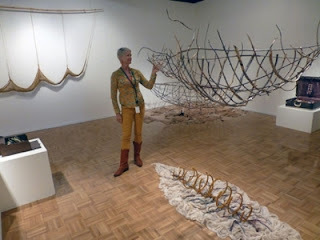 Her current exhibit at the Hyde Art Gallery on the Grossmont College campus offers boat forms, woven from various materials, as metaphors for the fragile vessel that is human life. Her exhibit, which will remain on view through September 12, has been linked to the campus-wide study of Siddhartha Mukherjee’s Pulitzer Prize winning The Emperor of All Maladies: A Biography of Cancer. Faculty members from various academic disciplines, including Bedwell, will discuss different aspects of cancer in a lecture series that will overlap the Fall 2013 and Spring 2014 semesters. As assignments go, traffic duty for the opening week of classes at Grossmont College was fairly routine for members of the Sheriff’s Senior Volunteer Patrol (SVP), and that was just how officials at the college hoped it would be. With new students unsure of where they should park, and parents and friends dropping other students off at various locations on the road that skirts the perimeter of the campus, traffic can sometime get quite gnarled. Having uniformed volunteers there to direct cars, and help pedestrians cross, made for a smooth first week. “It hasn’t been rough at all,” said Sheriff’s Lt. Jose Sanchez, who commands the force of Sheriff’s deputies assigned to the Grossmont-Cuyamaca Community College District, and who also was able to call in the SVP members as additional resources. Ahhh! 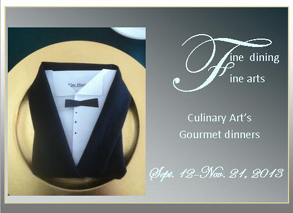 What better way to spend a Thursday evening out than with a gourmet dinner, followed by a concert or a play? The Culinary Arts Department of Grossmont College is collaborating with the Theatre Arts Department and with the Music Department to produce just such experiences on campus. It is not only patrons who are gratified by such culturally stimulating evenings, says Steve Baker, dean of arts, humanities, languages and communications. Fall semester begins Aug. 19 on a positive note at Grossmont and Cuyamaca colleges, with additional classes being offered to students as a result of the November 2012 passage of Proposition 30, the tax plan that fortified education after four devastating years of state budget cuts. The funding has allowed the colleges to restore 240 additional class sections this fall, up 11 percent from a year ago. For the first time since 2009, both colleges will be offering short-term classes during winter break in January, good news for students whose educational progress has been stalled in recent years by class shortages. Grossmont College in El Cajon is expecting more than 18,000 students this semester, while about 9,000 students will be attending Cuyamaca College in Rancho San Diego. “After years of having to turn away students because fewer classes were available, we’re delighted to welcome back students this fall and offer them the resources that allow them to pursue their educational goals,” said Bill Garrett, president of the Grossmont-Cuyamaca Community College District Governing Board. Cindy L. Miles, noted for her innovations in education and her caring leadership style as chancellor of the Grossmont-Cuyamaca Community College District, has been picked as the top chief executive officer for two-year colleges in the nine-state Pacific region by the Association of Community College Trustees. She joins four other regional winners of the annual award from the ACCT, a Washington D.C.-based organization representing trustees at more than 1,200 community colleges nationwide. As the Pacific region’s pick, Miles is automatically in contention for the national CEO honor to be awarded Oct. 4 at the 44th Annual ACCT Leadership Congress in Seattle, Wash. The association’s Pacific region includes a total of more than 240 community colleges in nine western states, two Canadian provinces, and three American territories in the Pacific. Regional winners were selected on extensive criteria, including innovative programs, committee memberships, empathy for others, educational publications, history of awards, and outstanding characteristics.